This fish asado recipe is a simple yet delicious dish that you can cook anytime or any day. There are no special ingredients needed and all of them are readily available in your favorite supermarket or wet market. Fish fillet can also be bought frozen in vacuum plastic packs and the most common is the cream dory. Labahita or surgeon fish are not always available and it is more expensive. But you can always substitute it with a cheaper and easy to find meaty fish. 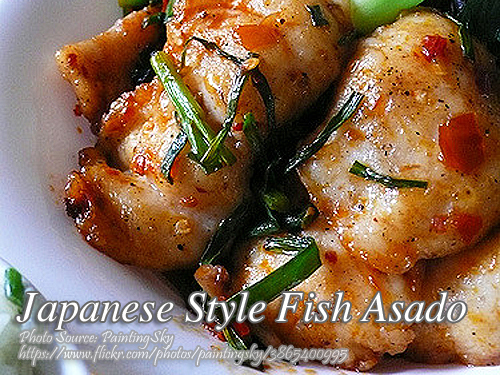 To cook Japanese style fish asado; Cut fish into 1″ square fillets. Add minced garlic and cornstarch. Fry in butter until golden brown. Then pour in soy sauce, Worcestershire sauce and season with pepper and MSG. Stir in onion. After 5 minutes, add water and stir until sauce thickens. Lastly, add pepper strips and leek. Cut fish into 1" square fillets. Add minced garlic and cornstarch. Fry in butter until golden brown. Then pour in soy sauce, Worcestershire sauce and season with pepper and MSG. Stir in onion. After 5 minutes, add water and stir until sauce thickens. Lastly, add pepper strips and leek. Serve hot.